Do Good Bus promises altruistic adventurism by bringing people together to help their community in a fun and social environment. If you're looking for a way to help your community - we'll show you how! The destination is a secret, but we'll be doing GOOD and having FUN all day. Boxed Lunch provided by Whole Foods is included. You will be prompted at check out to choose a lunch option. Do Good Bus is committed to eliminating plastic bottles from our rides, so please plan to bring a refillable water bottle. 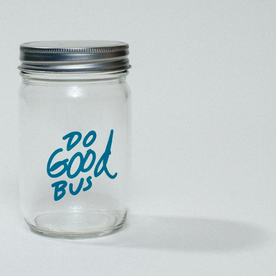 You can also purchase one of our Do Good Bus Mason Jars at a discounted price when you check out. Help support Do Good Bus AND the environment! You will receive a confirmation email a few days before the ride with more details. In the meantime, if you have questions, please email us. *REFUND POLICY: Tickets are refundable until 7 days before the event. Within 7 days of the event, if you need to cancel your ticket, Do Good Bus will transfer your ticket to an upcoming ride. Please email us with any questions. The Do Good Bus takes the guesswork out of volunteering by organizing a pre-planned day of direct giving. Volunteers hop on the bus for a day of fun, friendship, lunch, games and a mystery volunteer location where participants spend the day making an impact together. We like to say, you get on as strangers and leave as friends. The Do Good Bus creates community and purpose. Through sharing the special experience of volunteering and the powerful impact of giving back, the Do Good Bus creates a unique community that’s built to last. Powered by Dogeared.